I am making a video from the POV of a creature swimming underwater with a circular hood that opens and closes over its entire head. I envision this as being similar to an aperture on a camera, but with a depth to its movement; I would like it to travel in a "z" dimension, as well as "x" and "y' dimensions. Basically I want a camera swimming underwater, with a hood that covers it sometime, coming from all sides and closing in the center of the frame. Does anybody have any thoughts on how to execute this? I am thinking about sewing some kind of light fabric around a rubber band, and using a rubber band as the center of the hood, and somehow pulling back on several points of the rubber band to make the hood open up...I am not sure how sturdy this will be, and I also imagine I won't have much control over the rubber band's movement. I imagine I would have a clear plastic dome ontop of the camera (I'm thinking a go-pro) and have the hood mounted on top of the clear plastic dome, to give it a surface to slide along as it opens. Can anyone suggest a material similar to a rubber band, but maybe something that has a fixed path across which it travels? Almost like a camera aperture? I am also thinking about those head massagers, because they seem to expand in a uniform circle as you pull them over your head, but I don't know how to translate that to making this hood. I also thought of maybe sticking a camera inside a clear latex balloon, wrapping the hood around the balloon, and then inflating the balloon, so that the hood would pull back and the camera could 'see' through the balloon - I don't know if this would work for a number of reasons though. I have tried to think about something in nature that behaves this way, and the best I have come up with so far is a foreskin. I don't know yet how to use that information though. Maybe I could use some fabric that is elastic, the way skin can be elastic. The first idea that came to mind for me would be to use a cable mechanism using metal cable like you might find on a bicycle for operating the breaks. The end of the cable could be looped back to a connection point, so pulling on the free end of the cable would contract the loop, and pushing on the cable would expand the loop. Think of it a bit like the draw string on a hooded sweatshirt, but a bit more rigid. Am I right in thinking you want to create a blinking effect? 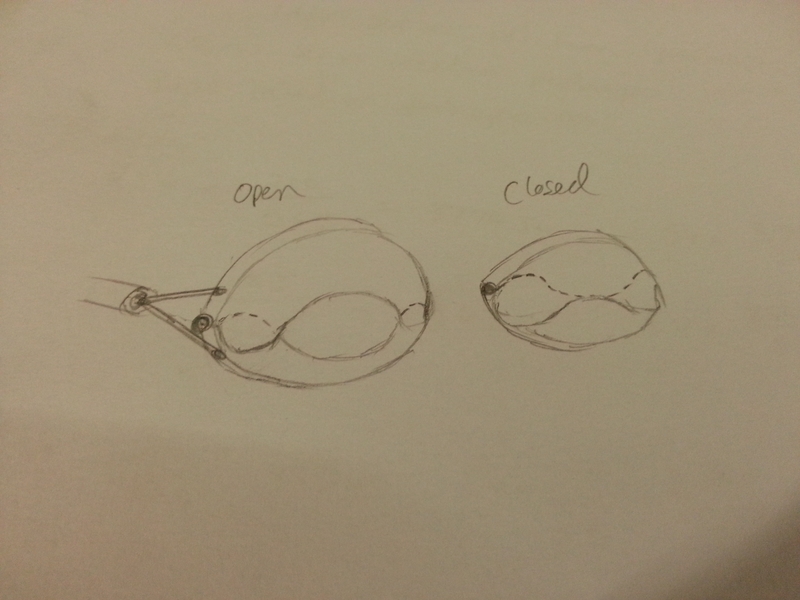 The problem I see is that it may be difficult to make it close completely using some sort of sphincter mechanism. Coulkd you perhaps use a traditional eyelid mechanism with exaggeratedly curved eyelid edges so that they overlap and converge to make a smaller hole as they do so? Thank you both for your suggestions. I will show you what I come up with. I'm assuming that the the blades on the aperture are opaque?